The Sun goes through a cycle of active and quiet periods approximately once every 11 years. This “solar cycle” is often associated with the number of sunspots, but there are other types of solar activity as well. So simply counting the number of sunspots is insufficient to understand the solar activity conditions. Microwaves are another indicator of solar activity. Microwaves have the advantage that, unlike sunspots, they can be observed on cloudy days. Also, monitoring multiple frequencies of microwaves makes it possible to calculate the relative strength at each frequency (this is called the spectrum). This research was published in the “Astrophysical Journal” on October 10, 2017. 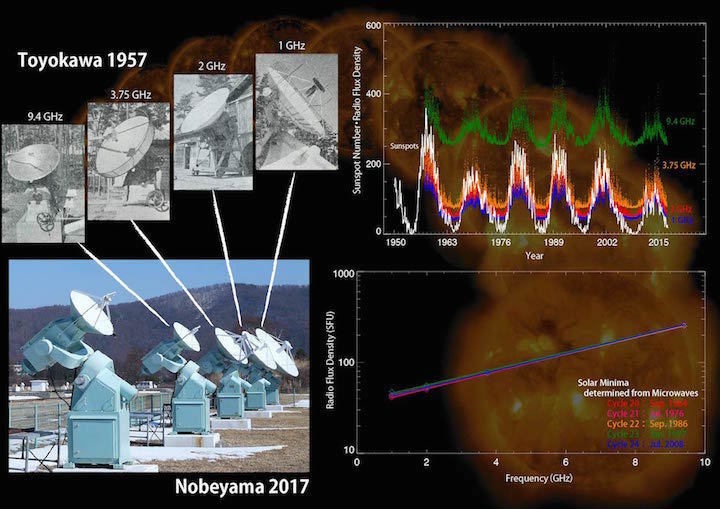 Astronomie - "Solar Minimum Surprisingly Constant"